The price of gold rose to $1,343 per ounce in January 2018. The price of gold increased 4% over the previous month and 12% over a year earlier, with month-to-month fluctuations in between. Gold prices rose steadily throughout the 2000’s, peaking in 2011 at $1,826 per ounce. Values dropped quickly in 2013 and continued to fall until bottoming in late-2015. In 2017, the price of gold increased somewhat, while continuing to change erratically on a short-term basis. Despite the assertions of “gold bugs,” gold is a commodity and thus unreliable as a currency. 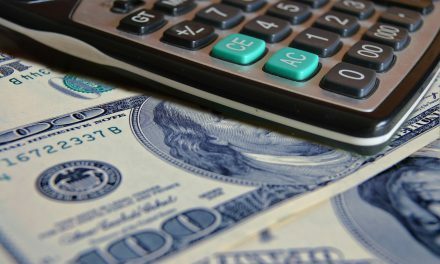 In contrast to fixed gold quantities, the U.S. Treasury can always print more dollars into circulation to supply funds to support the country’s economic growth (GDP). Without the flexibility of currency, you cannot control levels of inflation (or avoid deflation), and the value of gold fluctuates drastically due to its fixed supply and commodity speculation. Updated February 27, 2018. Originally copy released June 2014. In times of economic uncertainty, it’s natural to long for the mythologized simplicity of the past. Proponents of the gold standard argue that reviving the gold standard would obliterate worries of hyperinflation and deflation, since our supply of gold is fixed. Further, we wouldn’t experience those pesky economic booms and busts that tend to throw our housing market out of whack. Gold has the desirable properties of money that early writers in economics have stressed. It is durable, easily recognizable, storable, portable, divisible and easily standardized. Especially important, changes in its stock are limited. Another oft-cited benefit of the gold standard is its long-term stability. As seen in the chart below, the price of gold was reliable throughout the 1980s and 1990s, all the way up until the Millennium Boom burst. 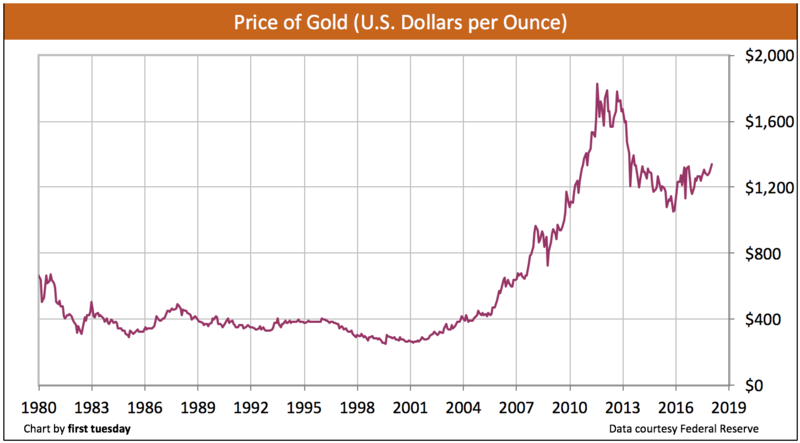 At that time, the price of gold rose exponentially, only beginning to deflate in 2013. However, this chart doesn’t tell the full story — not by a long shot. the cooperation needed from other nations in setting their currencies to a fixed price of gold. Under the gold standard, America had no major financial panics other than in 1873, 1884, 1890, 1893, 1907, 1930, 1931, 1932, and 1933. Oh, wait. The classical gold standard reigned over most global markets during the years 1880-1914. However, the gold standard failed during the global economic uncertainties of World War I. Following World War I, the United Kingdom introduced the gold bullion standard. Gold bars, rather than coinage, were used as bank reserves. The U.S. adopted a revised gold standard, which required its Treasury notes be backed by gold. Then came the Great Depression, which fundamentally altered the world’s outlook on economic policy. The Federal Reserve (the Fed) was essentially trapped by the limitations of the gold standard, since they were unable to “print” more gold to manage price and job stability. Banks failed and the economy lay in ruins for longer than a decade. The Bretton Woods system was introduced following World War II. Yet another revision of the gold standard, this system tied foreign currencies to the U.S. dollar, with a set exchange rate tied to gold prices. However, the dollar became overvalued under Bretton Woods (experienced through massive inflation) and it was ultimately abandoned. In 1971, the U.S. renounced the gold standard entirely. We now rely on a fiat system, meaning our currency’s value comes from government assurances rather than physical commodities like silver, gems, oil or, well, gold. Today, no nation in the world is attached to a gold standard and the U.S. dollar is the safe harbor for wealth throughout the global economy. How much gold is my house worth? It’s unlikely you’ve ever had a client ask you this question. If we lived in a world where the dollar was tied to the price of gold, or gold alone was the currency, this would be a real concern. Let’s suspend reality for a moment and visit that imaginary world. 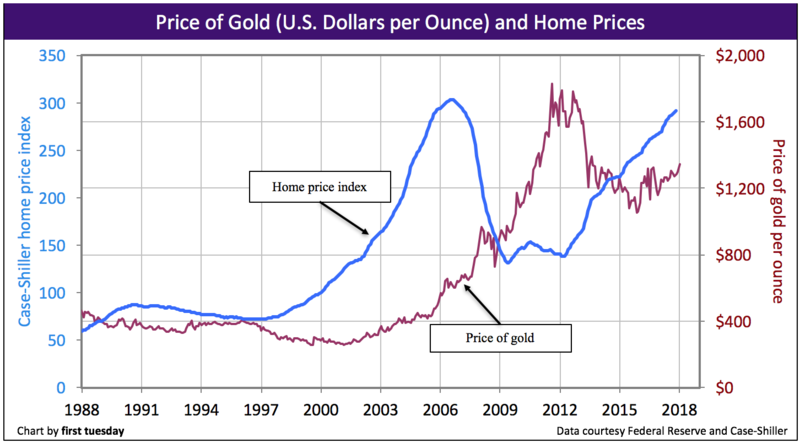 Below is a chart comparing two realities: changes in the home price index (which is based on the U.S. dollar) and changes in the price of gold. Currently they bear no direct influence on each other (however, their very indirect connection is found in interest rates, explored further below). Now, imagine that the dollar was tied to the price of gold. 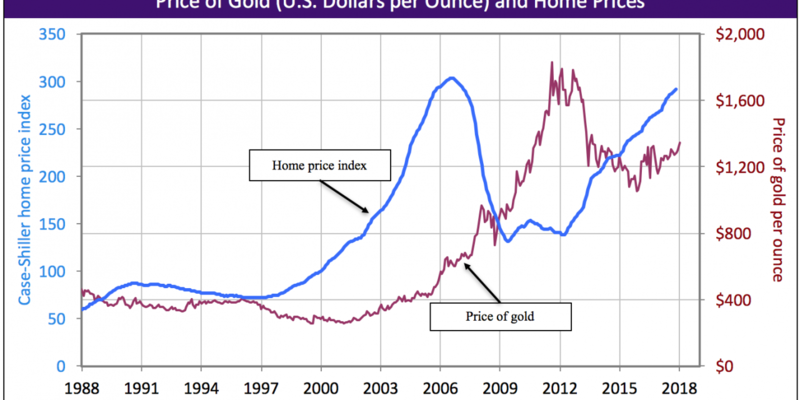 This chart below contrasts the actual home price index (the smooth, blue line) with what the home price index might look like if the dollar was tied to gold prices (the erratic, gold line). 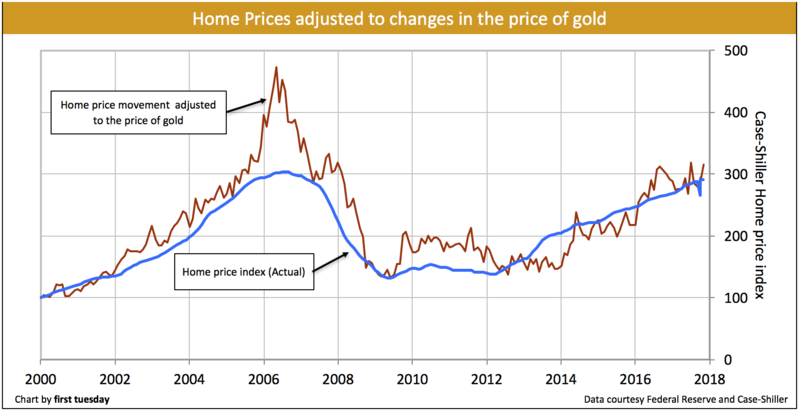 *The gold line indicating “home prices adjusted to the price of gold” is configured by first tuesday using the annual change of gold prices. This annual change is applied to actual home prices to get the fictional distortion of home prices if the dollar was tied to gold. It’s difficult enough to forecast where prices will be in a year, but at least prices move in a gradual fashion from month to month. On the other hand, if the dollar (and thus home prices) were tied to the erratic movement of gold prices, home values would likewise change in the most volatile way from month to month. Of course, under a gold standard, the price of gold is fixed. So, you are rightly wondering how home prices would be affected by a U.S. dollar fixed to a commodity. The answer: even though the price of gold is fixed under a gold standard, the value of gold still fluctuates due to evolving demand that cannot be compensated for by monetary policy. Any event causing the demand for gold to rise (along with the ensuing deflation) will result in a decline in demand for real estate. 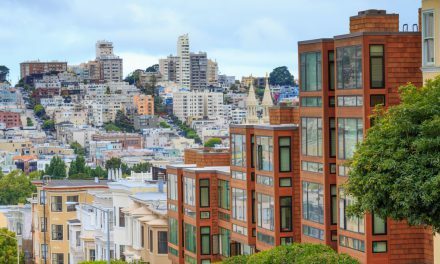 As the demand for property slips, home sales volume decreases and values take a blow in price reduction (which is the result of less gold buying more housing). Continuing our imaginary journey through a U.S. that uses the gold standard, now we must include the reality of interest rate movement in the gold standard equation. Monetary theory states that movement in long-term interest rates is reverse-mirrored in the changing price of gold. More simply put, when long-term interest rates rise, the price of gold falls. The logic, if you think about it, is pretty intuitive: with lower interest rates, it makes more sense to hoard gold now and push its actual use further into the future, which means higher prices in the short run and the near future. Mortgage rates are today set by a number of factors. But most simply, bond market expectations of monetary action by the Fed set mortgage rates, not the demand for gold. Mortgage rates began to increase in mid-2013 but dropped in 2016, hovering just above the historic low in 2012. The Fed plans to raise rates again in 2017. This rise will undoubtedly continue as a trend for the next two to three decades, emulating the rate cycle of the past 60 years. However, with rising rates, we can expect the price of gold to decrease. Under the gold standard, this is bad news for the dollar. So why not just keep interest rates where they are, you ask? Controlling interest rates is a significant weapon in the Fed’s deflation (and on the other side of the scale, hyperinflation) – fighting arsenal. The Fed increases rates to cool off a bubbling economy, and decreases rates to stimulate economic development when it’s stagnant. Thus, the gold standard further restricts monetary policy from doing its appointed task to keep the economy — prices and jobs — in check as it grows. 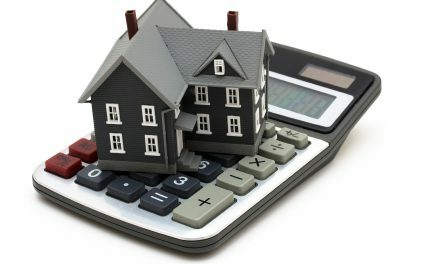 A return to the gold standard is most definitely not the answer for long-term stability in the housing market or the economy. Quite the opposite. Chaining the dollar to any commodity is a recipe for financial disaster. There is a reason every single nation has abandoned the gold standard to the history books. Let’s keep it there, please. PreviousPOLL: Do you actively maintain a real estate website?